This guide is based on the Publication Manual of the American Psychological Association, 6th ed., and gives citation examples for various sources commonly used in business. All page and section numbers refer to this manual. For in-depth APA paper and citation formatting (books, articles, websites etc...) see Citation Guide: APA Guide. SFU also offers MLA and other citation style guides. The Publication Manual of the APA (6th edition) includes scant information about how to cite document types common to business; in some cases there are different ways to interpret how to cite a specific item. The manual does state that when it offers no examples for the type of document to be cited, then you should find the closest example and use it to build your citation, which is what we have done with this guide (see p. 193, para.2 for more information on this rule). The important thing is to be consistent in the way you cite documents, and include information necessary for locating and identifying your source. If in doubt, ask a librarian, or contact your instructor. APA requires that the entire paper be double-spaced, including all the lines in the reference list. Number all pages consecutively, beginning with the title page, in Arabic numerals (e.g., 4, not IV) in the upper right-hand corner (Rule 8.03, p. 230). You need to cite and document any sources that you have consulted, even if you presented the ideas from these sources in your own words. You need to cite to identify other people's ideas and information used within your essay and to inform the reader of your paper where they should look if they want to find the same sources. A citation must appear in two places in your essay: in the body of your text ("in-text citations") and in the reference list (at the end of your paper). Capitalize all major words in titles within the body of the paper (Rule 4.15, p.101). E.g. Note: In reference lists, capitalize only the first word of the title and of the subtitle, and proper nouns. According to Marketline (2010),..."direct_quotation" (p. 34). "Direct_quotation"... (Acer, Inc., 2010, p. 17). When paraphrasing from a source, or when referring to an idea contained in another work, you are encouraged to provide a page number (Rule 6.04 p. 171). If there is no date of publication, use the abbreviation (n.d.). List two or more works by different authors who are cited within the same parentheses in alphabetical order by the first author's surname or group/organization name, e.g. (Bureau van Dijk, 2010; Datamonitor, 2009; Simpson, 2010) (Rule 6.16 p. 177). It is acceptable to abbreviate long names in the second and following in-text references. Just be sure to give the reader enough information to be able to match the in text reference to the citation in the reference list. Many electronic sources do not provide page numbers. In this case, use paragraph numbers preceded by the abbreviation 'para.' (Rule 6.05 pp. 171-172). If a source contains neither page nor paragraph numbers, cite the heading (shorten the heading if it is long) (Rule 6.05 pp. 171-172). The list of sources at the end of the paper (bibliography) is called the reference list in APA. The reference list must include all references cited in the text of your paper. Authors can be individuals or groups/organizations (e.g., Google, inc. or Euromonitor International). Order of references in the reference list is alphabetical, by the name of the group, or the last name of an individual author (Rule 6.25, p. 181) For an individual author's first name use only initials: 'Smith, J. ', not 'Smith, Jennifer'. If you have multiple publications by one author from different years order them earliest to latest: Smith, J. (1999) ... Smith, J. (2003). If there is no author available, use the title as the author in alphabetical order. Second and subsequent lines of each entry are indented 5-7 spaces. Double-space between all lines of your work, including references. When citing books, reports, and most other items except periodicals (magazine and journal articles), capitalize only the first word of the title and of the subtitle (i.e. the first word after a colon or a dash) and proper nouns (Rule 6.29, p. 185). APA's guidelines for citing online sources recommend using digital object identifiers (DOIs), available on items such as e-books and journal articles. To find a DOI a helpful tool is crossref.org's DOI Lookup. However, many common business sources do not have DOIs. This is especially true when you are using material found in databases like Business Source Complete (full text from thousands of sources). For these databases that bring together material published elsewhere you would use the publisher's URL. In many databases like Business Source Complete you will find the publisher's URL at the bottom of the 'publication details' or 'source' page for the article, industry report, etc... that you have chosen to use. For more information, see section 6.32, pp. 189 - 192 and the APA Style Blog DOI & URL Flowchart. When citing two or more sources with the same author and year, order them by date of publication if applicable, with the earliest month first. If there is only a publication year or the dates are the same, order them by title alphabetically. In both cases, assign a letter -- a, b, c, and so on to the citation, right after the year, inside the parentheses. This will allow you to specify which one you are citing in text. See rule 6.25, p. 182 for more information. In 2007 e-commerce accounted for a small percentage of sales, but was significant in the sales of books, travel and music (Euromonitor International, 2008a). According to Euromonitor International (2008b), Egypt's recession had ended by 2004. You should put the table # and a description of its contents above the table, and the Note and its contents below the table. (Purdue OWL: APA Format -Tables) If the table is copied exactly from a source, use the term "reprinted" in place of "adapted". Use "adapted" if you have altered the table. The following example is for a table you have reproduced in your paper exactly as it appears in another source. (Same format or state, no reconfiguration or new analysis). In a Note below the table you need to include: Reprinted from Title of Work, by Author. Retrieved from ... Date of Copyright by Copyright Holder. This work must have a full bibliographic entry in your Reference List even though the information in the Note field uses a lot of the same information. Comments: An example of a table reprinted from Print Management Bureau. Number the table(s), placing the word "Table" and the number above the title. The table and note below should appear in a relevant place in your paper, and include text referring to the table by its number- ". . .as shown in Table 1, less than 40% of the households surveyed stated they regularly consume hot sauce..."
If, however, you have compiled data from a variety of different sources and put it together to form your own table, you still need to cite where you got the information from. All sources that have been used to create the table's data need to be cited in a Note below the table. But all of these sources should have a full entry in the Reference List - if you have multiple publications by the same author in the same year please follow the guidelines in this section. When using multi-source data you want to describe what data is coming from where. e.g. : Note. Data for hot sauce consumption in the United States from Kantar Media (2010), for Canada from Statistics Canada (2011), and for Britain from Euromonitor International (2010b). ​If you have multiple kinds of data (population figures, consumer information, etc...) in one table you would describe each set of data. e.g. : Note. Population figures for XYZ from Author (date) and for ABC from Author (date). Data for pet ownership for XYZ from Author (date) and for ABC from Author (date). According to the APA, figures include: maps, graphs, charts, drawings, and photographs, in printed or electronic resources. Figure 1. Graph of the Sales of Luxury Accessories by Category: Value 2007-2012. Reprinted from Luxury Goods in the United States, by Euromonitor International, January 8 2013, retrieved from http://www.euromonitor.com/ Copyright 2013 by Euromonitor International. Comments: Include the word Figure and the figure number before the citation and start with a brief description of the figure. This is the figure# as it would appear, numbered consecutively in your paper - not the figure# assigned to it in its original resource. If your assignment is going to be published in a journal or as thesis, then before you reproduce any image in your paper it may be necessary to get copyright permission to do so from the original copyright holder and place the wording Reprinted with permission at the end of your citation. The following example is for citing a figure that you have created by compiling information from a variety of sources. For example, if you combined data from Passport GMID, Statistics Canada, and a book to create a new chart. All sources that have been used to create the figure need to be cited in the figure caption - after its number and name below the figure. But every source you list in the caption must have a full bibliographic entry in the Reference List - if you have multiple publications by the same author in the same year please follow the guidelines in this section. When using multi-source data you likely want to describe what data is coming from where. e.g. : Figure 1. 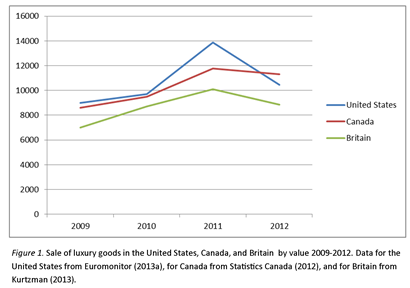 Sale of luxury goods in the United States, Canada, and Britain by value 2009-2012. Data for the United States from Euromonitor (2013), for Canada from Statistics Canada (2012), and for Britain from Kurtzman (2013). Comments: Provide the direct URL of the annual report because it is part of a large organizationally created website. See SFU's APA citation guide - websites for more information on this rule. There is no period after the URL. Do not insert a hyphen when breaking a long URL. Comments: Provide the URL of the publisher's home page (in this case SEDAR). Do not provide the direct URL to the report. See Citing Online Sources: Retrieval Statements for more information on this rule. There is no period after the URL. Comments: Provide the URL of the publisher's home page (in this case Ipsos). Do not provide the direct URL to the report, or the name of the database (Ipsos News Centre). See Citing Online Sources: Retrieval Statements for more information on this rule. There is no period after the URL. Comments: Provide the URL of the publisher's home page (in this case SEDAR or EDGAR). Do not provide the direct URL to the report. See Citing Online Sources: Retrieval Statements for more information on this rule. There is no period after the URL. Statistics Canada. (2008, June 6) Table 326-0001 Consumer Price Index (CPI), 2001 Basket Content, Monthly (table). CANSIM. Retrieved from CHASS http://dc.chass.utoronto.ca/cansimdim (accessed June 13, 2008). Comments: Use this citation style when citing data from a table or elsewhere. Provide the URL of the publisher home page (in this case CHASS). Do not provide the direct URL to the data. See Citing Online Sources: Retrieval Statements for more information on this rule. There is no period after the URL. Do not insert a hyphen when breaking a long URL. Statistics Canada has a guide about how to cite CANSIM tables here. ​Comments: This reference goes directly below a table reprinted or adapted from CHASS. If the table is copied exactly from CHASS, use the term "reprinted" in place of "adapted". Use "adapted" if you have altered the table. Note that the punctuation, and the order of title, author, etc., is different when citing a table from when citing text. Provide the URL of the publisher/distributor's home page (in this case CHASS). Do not provide the direct URL to the table. See Citing Online Sources: Retrieval Statements for more information on this rule. For more information about citing CANSIM data please see the CANSIM Citation Guide from Statistics Canada. See Formatting Tables for more information. Comments: Use this citation style when citing data from a table or elsewhere. Use the citation style below if you are reprinting a table from this source in your work. Provide the URL of the publisher's home page (in this case Ipsos). Do not provide the direct URL to the data. See Citing Online Sources: Retrieval Statements for more information on this rule. Note. Adapted from Less than half (47%) of Canadians enjoy shopping for presents for the holidays, by S. Simpson, November 1, 2010, retrieved from http://www.ipsos-na.com Copyright 2010 by Ipsos North America. ​Comments: This reference goes directly below a table reprinted or adapted from Ipsos News Centre. If the table is copied exactly from Ipsos, use the term "reprinted" in place of "adapted". Use "adapted" if you have altered the table. Note that the punctuation, and the order of title, author, etc., is different when citing a table from when citing text. Provide the URL of the publisher's home page (in this case Ipsos). Do not provide the direct URL to the table. See Citing Online Sources: Retrieval Statements for more information on this rule. Include the copyright statement. Comments: Use this citation style when citing data from a table or elsewhere. Use the citation style below if you are reprinting a table from this source in your work. Provide the URL of the publisher's home page (in this case Vividata). Do not provide the direct URL to the data. See Citing Online Sources: Retrieval Statements for more information on this rule. Comments: This reference goes directly below a table reprinted or adapted from Vividata (previously Print Measurement Bureau (PMB)). If the table is copied exactly from Vividata, use the term "reprinted" in place of "adapted". Use "adapted" if you have altered the table. Note that the punctuation, and the order of title, author, etc., is different when citing a table from when citing text. Provide the URL of the publisher's home page (in this case Vividata). Do not provide the direct URL to the table. See Citing Online Sources: Retrieval Statements for more information on this rule. Include a copyright statement. Comments: Use this citation style when citing data from a table or elsewhere. Use the citation style below if you are reprinting a table from this source in your work. Provide the URL of the publisher's home page (in this case Thomson Reuters). Do not provide the direct URL to the data. See Citing Online Sources: Retrieval Statements for more information on this rule. Comments: This reference goes directly below a table reprinted or adapted from ThomsonOne. If the table is copied exactly from ThomsonOne, use the term "reprinted" in place of "adapted". Use "adapted" if you have altered the table. Note that the punctuation, and the order of title, author, etc., is different when citing a table from when citing text. Provide the URL of the publisher's home page (in this case Thomson Reuters). Do not provide the direct URL to the table. See Citing Online Sources: Retrieval Statements for more information on this rule. Include the copyright statement. Comments: Use this citation style when citing data from a table or elsewhere. Use the citation style below if you are reprinting a table from this source in your work. Provide the URL of the publisher's home page (in this case United Nations Statistics Division). Do not provide the direct URL to the data. See Citing Online Sources: Retrieval Statements for more information on this rule. There is no period after the URL. Note. Adapted from Arrivals of non resident tourists/visitors, departures and tourism expenditure in the country and in other countries, by the World Tourism Organization, 2010, August 11, retrieved from http://unstats.un.org Copyright 2010 by the United Nations Statistics Division. Comments: This reference goes directly below a table reprinted or adapted from UNdata. If the table is copied exactly, use the term "reprinted" in place of "adapted". Use "adapted" if you have altered the table. Note that the punctuation, and the order of title, author, etc., is different when citing a table from when citing text. Provide the URL of the publisher's home page (in this case the United Nations Statistics Division). Do not provide the direct URL to the table. See Citing Online Sources: Retrieval Statements for more information on this rule. Include the copyright statement. Comments: Use this citation style when citing data from a table or elsewhere. Use the citation style below if you are reprinting a table from this source in your work. n.d. (no date) is used in place of the date, as this item was not dated. Provide the URL of the publisher's home page (in this case the World Bank Group). Do not provide the direct URL to the data. See Citing Online Sources: Retrieval Statements for more information on this rule. There is no period after the URL. Note. Adapted from Mobile cellular subscriptions (per 100 people), by World Bank Group, n.d., retrieved from http://www.worldbank.org/ Copyright by the World Bank Group. Comments: n.d. (no date) is in place of the date because this table was not dated. This reference goes directly below a table reprinted or adapted from World Development Indicators. If the table is copied exactly, use the term "reprinted" in place of "adapted". Use "adapted" if you have altered the table. Note that the punctuation, and the order of title, author, etc., is different when citing a table from when citing text. Provide the URL of the publisher's home page (in this case World Bank Group). Do not provide the direct URL to the table. See Citing Online Sources: Retrieval Statements for more information on this rule. Include the copyright statement. Comments: Provide the URL of the publisher's home page (in this case Marketline). Do not provide the direct URL to the report, or the name of the database (Business Source Complete). See Citing Online Sources: Retrieval Statements for more information on this rule. ​Comments: For electronic versions based on a print source (such as PDF), include page numbers (6.32, p. 189). The retrieval date is not required unless the source material is likely to change over time. Generally it is not necessary to include information about which database it was retrieved from (6.32, p. 192). When a DOI (Digital Object Identifier) is available, include the DOI right after the volume/issue number using the format: “doi:xxxxxxx” (6.32, p. 191). Can't find the DOI? DOI Lookup. If there is no DOI assigned, give the URL of the journal’s home page in place of the DOI. You may need to do a quick web search to locate the journal's website address if you found the article in a library database (e.g. Business Source Complete or PsychInfo).There is no period at the end of the URL. Comments: The author is the analyst who wrote the report, their name usually appears in the top right-hand corner of the reports main page, beside the date it was published. If there is no author, the title is used instead, see - Formatting References. IBISWorld reports do not have page numbers, to cite either a direct quotation or a paraphrased section of the report it is best to cite the heading (in this case - Demand Determinants) under which the information you are quoting came from. See - formatting in-text citations for more information. Because IBISWorld creates unique reports, your Retrieved from statement uses the URL of that database. See Citing Online Sources: Retrieval Statements for more information on this rule. Comments: In the reference example 'Standard & Poor's Stock Report' references the resource type - S&P offers several more including Industry Survey and Subindustry Review which would be inserted into that section of the reference when used. S&P reports do not have page numbers; to cite a direct quotation or a paraphrased section of the report it is best to cite the heading (in this case - Media Tablets) under which the information you are quoting came from. See - formatting in-text citations for more information. In regards to the Retrieved from statement see Citing Online Sources: Retrieval Statements for more information on this rule. Comments: Use this citation style when citing data from a table or elsewhere. Use the citation style below if you are reprinting a table from this source in your work. Include page number(s) when available.Provide the URL of the publisher's website (in this case Euromonitor International). Do not provide the direct URL to the report. There is no period after the URL. If you have more than one citation with the same author and year, follow the directions under Same author, multiple publications in one year. Note. Adapted from Consumer lifestyles in Egypt, by Euromonitor International, December 17, 2008, p. 16, retrieved from http://go.euromonitor.com/Passport-Home Copyright 2008 by Euromonitor International. Comments: This reference goes directly below a table reprinted or adapted from Passport GMID. If the table is copied exactly from Passport GMID, use the term "reprinted" in place of "adapted". Use "adapted" if you have altered the table. Note that the punctuation, and the order of title, author, etc., is different when citing a table from when citing text. Include a page number. Provide the URL of the publisher's website (in this case Euromonitor International). Do not provide the direct URL to the table. See Citing Online Sources: Retrieval Statements for more information on this rule. Include a copyright statement. For more in-depth discussion about how to cite websites in APA style, please see the SFU APA Guide - Websites. Comments: Provide the direct URL of the website. There is no period after the URL. Do not insert a hyphen when breaking a long URL. Comments: n.d. (no date) is in place of the date because this document was not dated. Provide the direct URL of the website. There is no period after the URL. Do not insert a hyphen when breaking a long URL.